Kathy writes: "I have a ‘Better Boy’ that after a lull over the summer started producing again! It’s full of green tomatoes in various sizes. Since it looks like the temps are going to dip pretty low in the next few days, should I pick the larger ones and let them ripen inside? 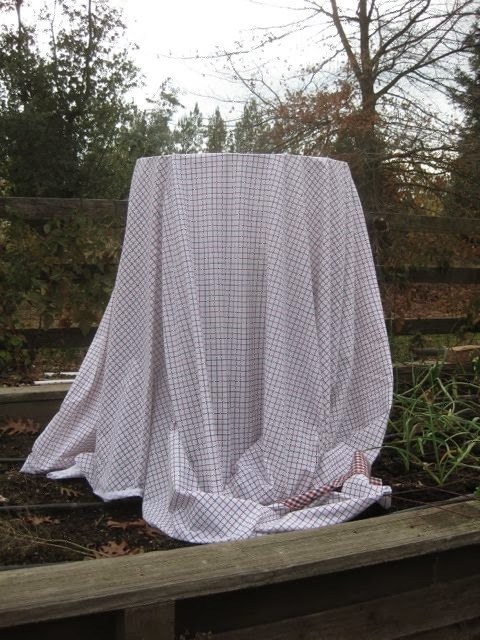 Enquiring minds need to know……"
I read an intriguing garden column in the Redding, CA newspaper that suggested one way to get tomatoes to ripen outdoors now. It said: "A rule of thumb is, in the fall, take off all leaves and stems and all fruit that will not have time to develop before frost. You'll end up with skeletal vines and bare fruit, which is exactly what you want, since now all the plant's energy will go into ripening that fruit." That might work in the mild climate areas of southern California, but here in Northern California, you're asking for a quicker end to tomato season if you do that. October-November temperatures are typically dipping down into the 40's here; in November, nighttime lows in the 30's are quite likely. When nighttime temperatures are in the 40's and below, fruit development slows to a crawl and causes other problematic issues. Even here in the milder Sacramento region, harvesting red tomatoes in mid-November is an iffy proposition, at best. The typical Sacramento gardener Thanksgiving trick: harvest the remaining tomatoes the day before. Immediately cut off the damaged, ugly portions. Serve the miniscule, pretty remains to Thursday's dinner guests, chopped and mixed into a salad. "Why yes, we can harvest tomatoes on Thanksgiving!" Please don't ask to see the whole tomatoes, though. You might lose your appetite. 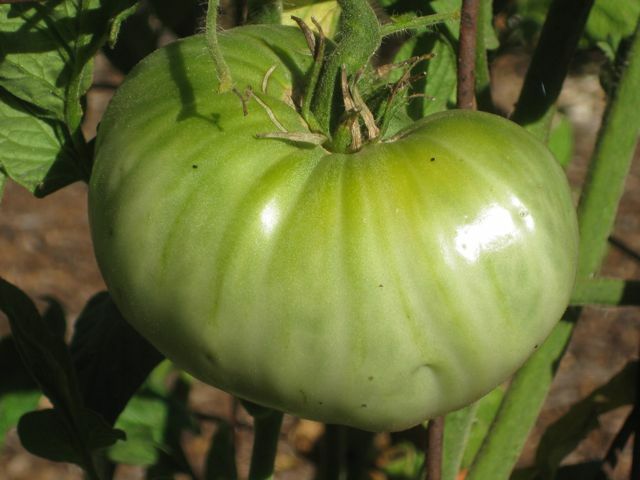 As the fall weather finally begins to turn cooler, gardeners are faced with this annual dilemma: will those green tomatoes in the garden ripen? In many areas of California, fresh garden tomatoes remain edible until late October or early November. They may not be pretty...but they are still a heckuva lot tastier than any tomato you'll find in a grocery store. 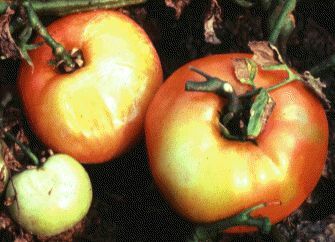 By mid-November, remaining tomatoes are subject to harsher, colder, wetter weather leading to more outbreaks of blight diseases, insect infestations and bird pecking. Are you tempted to harvest those green tomatoes, now, hoping they'll ripen up indoors? Here are a few tips. 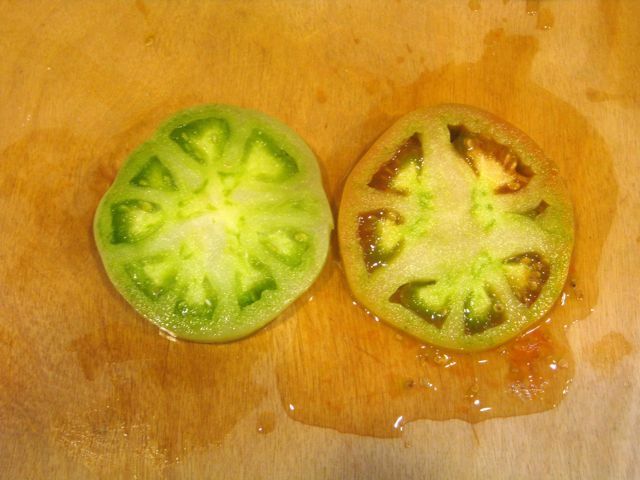 How do you tell when a green tomato, harvested early to prevent freeze damage, will ever turn red and ripen? This can simply be done with a sharp kitchen knife. Harvest a tomato typical of the majority of green tomatoes on your plants. Look at size but pay particular attention to fruit color. Slice through the center of the tomato. Closely examine the seed within the fruit. If the seeds are covered with a clear gel which cause them to move away from the knife, then that fruit will eventually turn red and ripen. If the seeds are cut by the knife then those fruit will never properly ripen. 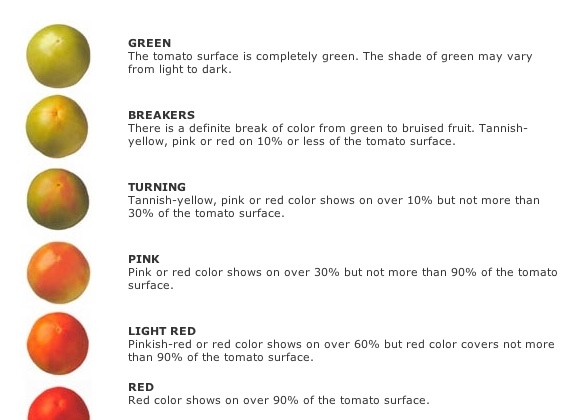 Compare the color and size of the tested fruit when harvesting tomatoes on your plants. Most similar fruit will eventually ripen and turn red. Cooler September temperatures help fruit to ripen because the red tomato pigments, lycopene and carotene, are not produced above 85 degrees F; nor is lycopene below 50 degrees F.
As late September approaches, gardeners often try to extend the life of their plants by covering with cloth or plastic. Covering plants works well for nearly red tomatoes, but not as well for mature green ones. Though foliage may sometimes be saved, research shows that chilling injury on green fruit occurs at temperatures of 50 degrees and decay losses rise markedly on fruit exposed to 40 degrees F. Red ones well on their way to ripening tolerate colder temperatures. Before frost hits and plants go down, pick and bring fruit indoors to ripen. Clip fruit with a very short stem piece left on but one that’s not long enough to punch holes in other tomatoes. Stems ripped out of fruit will open them to decay. Eliminate (immature) green fruit, as research shows it’s more likely to spoil than ripen and never develops the flavor consumers want anyway. Mature green fruit will develop good flavor. 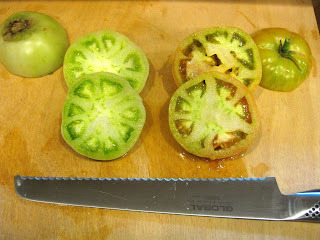 Mature green tomatoes are well sized and have turned light green to white. If cut open, seeds are encased in gel and no empty cavity space is present. In addition to mature green, sort and store fruit by these groups as they will ripen at similar speeds. Fruit may be "turning" with a tinge of pink color showing, "pink" with 30 to 60 percent color showing, "light red" with 60 to 90 percent color present, and others "fully red" but not soft. Store mature green tomatoes at 55 to 70 degrees F. Once fruit is fully ripe, it can be stored at 45 to 50 degrees F with a relative humidity of 90 – 95%. Recommended refrigerator operating temperatures of 40 degrees are certainly too cool to ripen mature green tomatoes and are colder than desired for ripe ones. Ripening enzymes are destroyed by cold temperatures whether in the garden or in a refrigerator. Ripen tomatoes in well-ventilated, open cardboard boxes at room temperature checking them every few days to eliminate those that may have spoiled. Mature green tomatoes will ripen in 14 days at 70 degrees F and 28 days at 55 degrees F.
The folks at UC Davis recommend storing a small amount of green tomatoes in a carton box on fiber trays or paper layers. 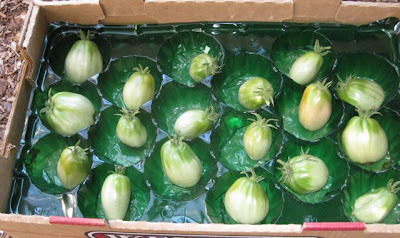 One way to add some air circulation to the bottom, especially in warm conditions: store the tomatoes in a fruit box that contains a perforated plastic liner. Get a rope. 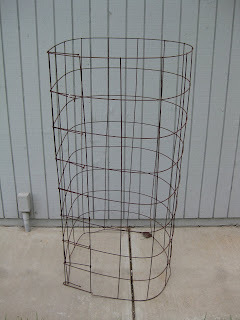 By pulling up your plants (root and all, if possible) and hanging them right-side up in a garage or basement, you can prolong their time on the vine for a few more weeks. Just string up some clothesline or heavy rope across one wall, and clip the tops of the plant to the rope with clothespins or binder clips. 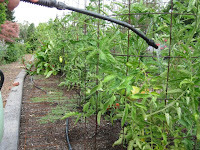 Try to avoid too much sunlight, or your tomatoes will spoil or ripen unevenly. A temperature of 60-72 degrees is ideal. Go the paper route. My grandma used this trick to ripen up green ones over a period of a week or two. 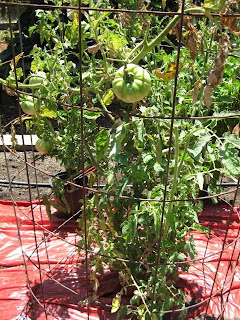 Pick only the green tomatoes without cracks, holes, or blight, wrap them individually in newspaper, and place them in a single layer in the bottom of a wooden crate or basket. 2. Whisk eggs and milk together in a medium-size bowl. Scoop flour onto a plate. Mix cornmeal, bread crumbs and salt and pepper on another plate. Dip tomatoes into flour to coat. Then dip the tomatoes into milk and egg mixture. Dredge in breadcrumbs to completely coat. Preheat oven to 425. Spray a baking sheet lightly with canola oil or non-stick spray or line with parchment paper. Nutrition (per serving): 94 calories, 12 calories from fat, 1.4g total fat, 0mg cholesterol, 214.6mg sodium, 287.3mg potassium, 18.7g carbohydrates, 2.8g fiber, 5.1g sugar, 3.2g protein. Rain, Frost, Freeze? Welcome to Late November, Citrus Tree Owners! Heading out for grandma's house for Thanksgiving Week? We are now officially entering the shivering season for the Central Valley, Bay Area and low foothills. 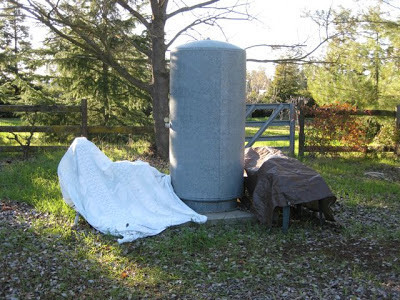 Late November through mid-February is the most critical time here for protecting frost-susceptible plants. 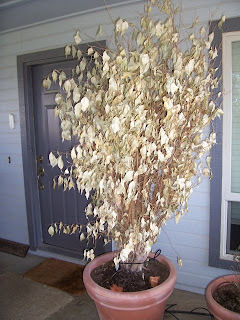 Not a rare, white weeping fig. More like "frozen fig"
Don't let your citrus trees and other frost sensitive plants (such as the freeze damaged weeping fig, above) get caught by a "Turkey Day Surprise" while you're away. Morning lows will be dipping into the upper 20's and low 30's. The National Weather Service is predicting rain for Northern California for Tuesday and Wednesday, with snow levels dropping to near 2000 feet in the Sierra foothills. When the rain blows out Wednesday night, more colder air is coming in for Thanksgiving, Friday and Saturday. Overnight lows are forecast to dip below freezing, with frost and a freeze highly likely...depending where you live, and where you're citrus trees reside. All gardening is local. That thermometer on the window or door frame of your house? It's showing the temperature at that particular point on your property. And, it's probably showing a reading that is getting a boost from the heat that's escaping your house. On the other hand, the temperature where your citrus trees are located is probably lower. Putting a high/low digital outdoor thermometer near your citrus trees, and comparing it to the morning reading on your house-mounted thermometer may raise more goosebumps on your arms. At our place, it is not uncommon to see a six or seven degree lower temperature at 7 a.m. next to our citrus, despite the fact that the nearest Meyer lemon tree is only 20 feet away from the house. Get yourself one of those thermometers and check the readings in your own yard on these shivering mornings. That thermometer on the side of the house might say 33 degrees...but the one out at your frost-sensitive plants might say 27, enough to turn the insides of your lemons to mush. 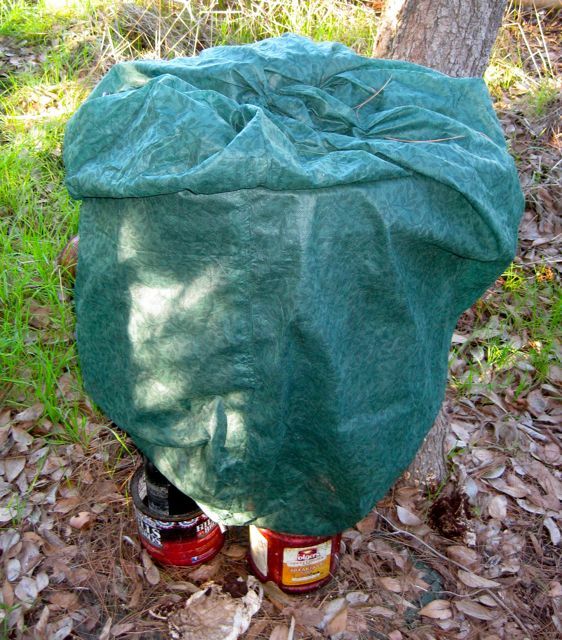 Several days before an expected frost (temperatures dipping down to 32 degrees) is the time to gather the necessary implements to protect your citrus trees, including giving the ground beneath them a good soaking (moist soil is better than dry soil at moderating the temperature beneath the tree). Most gardeners first thoughts about protecting their citrus trees during a frost or freeze is, "protect the fruit!" Four Winds Growers, the Winters-based wholesale grower of many excellent varieties of citrus, offers the Citrus Variety Information Chart at their website, FourWindsGrowers.com. Included in that chart is extensive information about each citrus variety, including suitability for indoor growing; its bloom and fruiting seasons; its recommended summer heat level to produce good fruit; and, its minimum tolerable temperature for preservation of fruit quality. The chart points out that lemons, limes and citrons are most sensitive to frost, while sweet oranges, grapefruit, tangerines and calamondins are intermediate. Kumquats and Owari Satsuma Mandarins are the most frost-tolerant, braving temperatures into the twenties (that would classify as a freeze). From that chart, here are the temperatures (in degrees Fahrenheit) at which citrus fruit damage may occur. But what about the overall health of the citrus tree? How low can temperatures go during a freeze event before the tree is toast? "I consider 22 degrees to be terminal for citrus tree cambium cells," says Cedar Seeger of Four Winds Growers. The cambium layer is the growing part of the tree, the cells that are producing new wood and healing wounds. 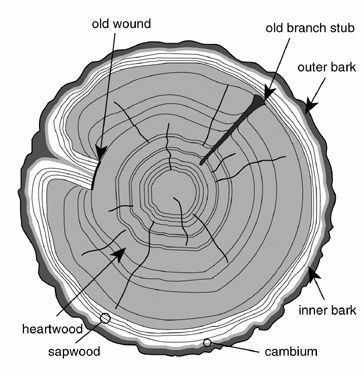 It is located just beneath the bark. 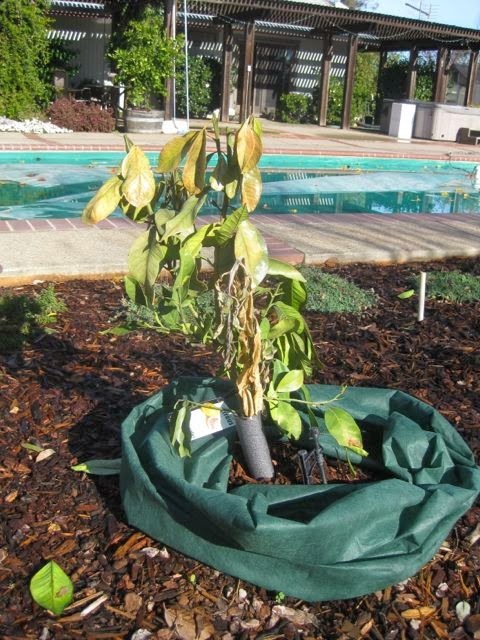 "We often have a two to three hour dip to 28 degrees after storms; and if the above conditions are met, even Meyer lemon trees can survive, albeit not to happily, without protection. 28 degrees for four hours probably won't kill the tree, provided the rootstock cambium doesn't freeze. It will defoliate and lose twigs. At 24 degrees things start to get dicey. That's when the blanket, frost cloth, bonnet and/or the old-style, large outdoor Christmas lights that give off some heat will work wonders. Remember, those blankets and bonnets need to go to the ground in all cases." You may recall Thanksgiving Week of 2010, when morning low temperatures dipped well below freezing for six days in a row, led by a citrus-killing 27 degree morning on Thanksgiving. When a large, cold-air mass moves in from the north after a storm in the winter, that is called an advective freeze. The one that sticks out in most gardeners' memories here was the freeze of mid-December 1990, when nighttime temperatures fell into the teens for several days in a row, with a couple of days that didn't climb above 32 degrees. To add even more injury, a second cold snap hit near the end of the month, with temperatures dipping into the mid-20's. Many of the most susceptible (frost intolerant) landscapes were completely lost; some nurseries never recovered. "Our first year in the citrus business here in Winters was 1990-91. My wife, Mary Helen, and I have a Masters in Disaster," says Cedar Seeger. Which is why Cedar is an adherent of watching the dew point, the temperature at which saturation has been reached, when water vapor condenses into water. 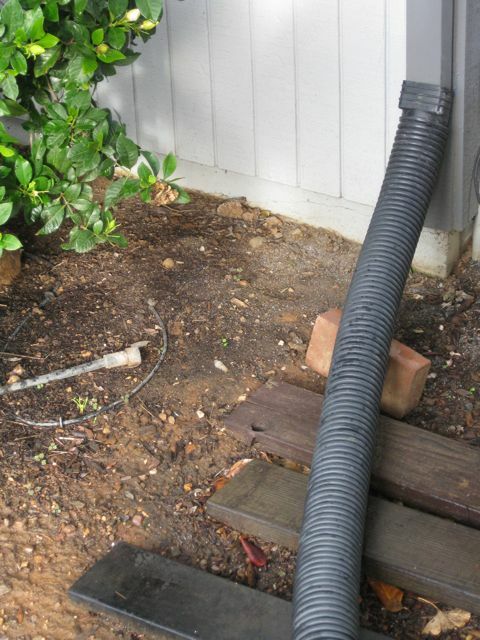 The lower the dew point, the more danger of cold damage to your plants. One good online source for dew point temperatures is the National Weather Service's Tabular Forecast Page , which offers a forecast for two days in advance (that link is for Sacramento). "A good watering going into an advection night is mandatory. If the ground and surrounding grass is wet, it creates a micro dew point environment around the trees. In a dry, cold La Nina winter such as we're about to get, it is important to remember the dew point concept. At 22 and below, it's full on emergency response, pile straw, hay around trunks, anything, lights, covering," says Cedar, a man who learned these lessons the hard way. But he is not an adherent of running sprinklers during a freeze. 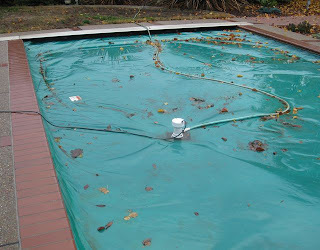 "My experience with overhead sprinklers is that they more often than not freeze up, and then it's all over. And you are risking branch breakage on that ice-entombed citrus. Yeah, it can work, but screw it; it's messy, risky and a lot of work. 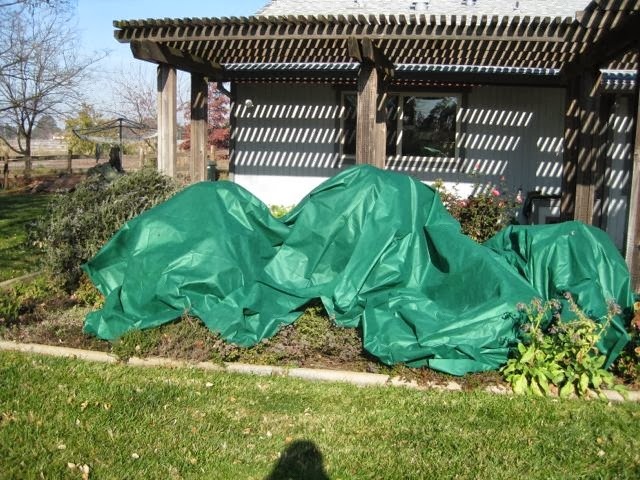 Use the large Christmas lights and mid-weight frost covers. But pay attention to the trunk / rootstock. If that freezes, it's a goner." Citrus trees most at risk to fatal damage from a frost or freeze are the young trees. 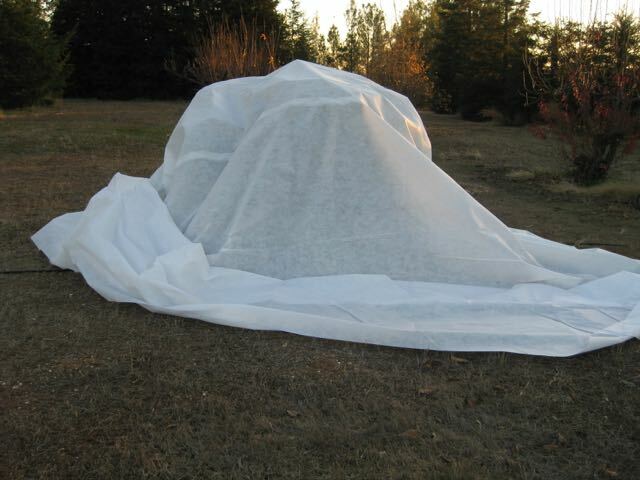 It is vital that they be covered completely when a heavy frost or freeze is predicted, and provide protection for the trunk, bud union and rootstock area. That can include trunk wraps, newspapers, old carpeting. If possible, move small containerized citrus closer to the house, preferably next to a south or west-facing wall to maximize reflected heat. In the book, "All About Citrus and Subtropical Fruits", author and grower Lance Walheim also suggests applying a copper-based fungicide to the trunk and then mounding or banking soil against the trunk and lower limbs. Just don't leave it on too long; fungal rots can develop (that copper can only work for a limited time). He advises leaving that soil next to the trunk from Thanksgiving until February, or March, in colder areas. Don't be fooled by the predictions of a warmer and wetter El Nino winter. Mornings can still get too chilly for unprotected citrus. Welcome to Turkey Weather season! You know how it is: you hear something enough, you believe it's true. Look on the side of any box of water soluble fertilizer, or any organic gardening guide, and there will be instructions on foliar feeding: spraying a water soluble fertilizer onto the leaves of a plant, as an alternative source of nutrition for the plant. Awhile back on the radio show, a tempest in a teapot developed when Milo Shammas, the President of the Dr. Earth line of organic products, mentioned that the best way to apply a foliar fertilizer, which he endorses, is in as fine a spray as possible. In his corner, Rodale's Encyclopedia of Organic Gardening, which states: "Plants can absorb liquid fertilizers through both their roots and through their leaf pores. Foliar feeding can supply nutrients when they are lacking or unavailable in the soil, or when roots are stressed. 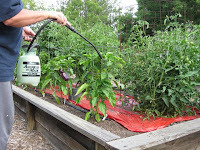 It is especially effective for giving fast growing plants like vegetables an extra boost during the growing season...Any sprayer or mister will work, from hand trigger units to knapsack sprayers. Set your sprayer to emit as fine a spray as possible." Disagreeing with the "fine spray" approach is another organic advocate and frequent guest of the radio shows, Steve Zien of the Sacramento area-based organic consulting service, Living Resources Company. Zien says, "Some time ago I read a few studies that indicated that most of that (spraying with a fine spray) was not necessary. The studies used radio isotopes to follow the nutrients in the foliar fertilizer. They found that it got into the plant even when the water droplets were large. Another study indicated that even with the best spray equipment making the smallest water droplets possible with today's technology, the water droplets were still too large to physically enter the plant. They concluded that water droplet size is not important when foliar feeding. 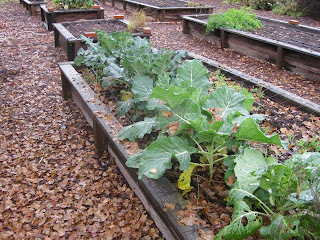 Other studies have shown that foliar fertilizer can even be absorbed by branches and tree trunks. These two facts indicate that where you spray is also not critical. Numerous studies have shown that foliar feeding is much more efficient at getting the nutrients absorbed and to the entire plant and more rapidly as well. I think all the studies emphasize that even with all the benefits of foliar feeding, it cannot be considered a substitute for proper soil nutrition, and I fully agree with that. You need to feed the soil foodweb for healthy, pest resistant plants.I no longer worry about where I apply the foliar fertilizer. I try to apply it to as many plant surfaces as possible but do not worry about paying attention to the undersides of the leaves." • Tree and shrub species differ dramatically in their ability to absorb foliar fertilizers. • Proper plant selection relative to soil type is crucial to appropriate mineral nutrition. • Foliar spraying is best accomplished on overcast, cool days to reduce leaf burn. • In landscape plants, foliar spraying can test for nutrient deficiencies, but not solve them. • Micronutrients are the only minerals that are effectively applied through foliar application. • Foliar application will not alleviate mineral deficiencies in roots or subsequent crown growth. • Foliar spraying is only a temporary solution to the larger problem of soil nutrient availability. • Minerals (especially micronutrients) applied in amounts that exceed a plant’s needs can injure or kill the plant and contribute to environmental pollution. 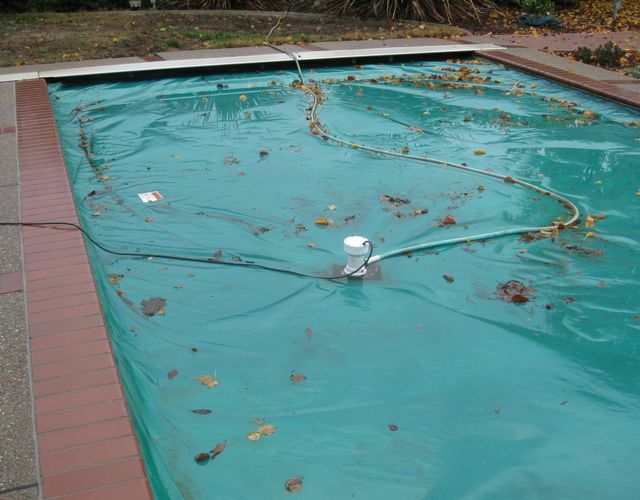 • Any benefit from foliar spraying of landscape trees and shrubs is minor considering the cost and labor required." Chiming in is Deborah Flower of American River College: "I have been reading 'Plant Physiology' by Taiz and Zeiger, and 'Mineral Nutrition of Higher Plants' by Horst Marschner. The latter discusses foliar feeding in chapter 4. It says: there are small pores in the cuticle through which minerals can enter the plant. These pores are in highest density near guard cells around stomata and at base of trichomes (hairs, scales, etc.). They are tiny and lined with negative charges. So, only very small (less than one nanometer in diameter) cations and uncharged molecules will enter these openings. Rate of uptake is VERY low. Rate of uptake varies between species and growing conditions. Plants with thicker cuticle (due to species or growing conditions) absorb less. Older leaves have lowest rate of uptake due to leaky plant cells that fill intercellular spaces, which is where ions travel in the leaf. A very high concentration of ions is needed outside the leaf to get any into the leaf. The supply of nutrients in the leaf from foliar feeding is temporary. There is limited movement of nutrients from leaves to other plant parts. Urea can enter leaves through these openings (ammonia and nitrate cannot), because it is an uncharged particle, but can cause damage in the leaf, due to nutrient imbalance in the leaf once it is absorbed. Surfactants should be used with all foliar feeding to increase surface spread of spray. So, my opinion is that yes, plants do absorb nutrients through their leaves (neither book mentioned absorbtion through branches or trunks) but the amount is very small, nutrients do not travel far from point of entry, and there is lots of nutrient run-off during the process, which can lead to pollution. Therefore, foliar feeding is not effective as the primary source of nutrients for plants. I disagree that foliar feeding gets nutrients to all parts of the plant. There is lots of evidence that fertilizer that gets into the leaf migrates little to other parts of the plant. It stays in the leaf or travels to a strong sink like a fruit. Foliar feeding can correct micro-nutrient deficiencies in leaves and some fruit, but until the nutrition is balanced in the root zone, the symptom will continue to appear in new plant parts. Many of my students seem to believe foliar feeding is better for the plant than nutrient absorption by roots, and that concerns me. Foliar feeding can be used to correct some nutritional problems, primarily in production situations, but should not be relied on as the primary source of nutrients for the plant. If people are foliar feeding I believe most of the nutrients being absorbed by the plant are entering the roots, probably after running off the plant onto the soil." Milo Shammas, of Dr. Earth, responds: "Fred, all very true and I agree with her, I do not recommend foliar feeding as the primary source of nutrients. Whatever runs off the foliage will ultimately be absorbed by the root system. Nothing can replace ion absorption through the root system. I own and manage 45 acres of organic walnuts and I personally spray my ranch with Dr. Earth liquid solution twice a year, I do spend the money on it, I have conducted the efficacy and I know it works, I do believe in it, I do endorse it, I do not depend on it." After standing back, listening to all this, I have come to the conclusion: although foliar feeding may have minimal value, it does have a bigger, positive effect: washing off bad bugs from the leaves. Of course, a spray of water can accomplish the same thing.